Welcome to the Colossians Words Challenge! 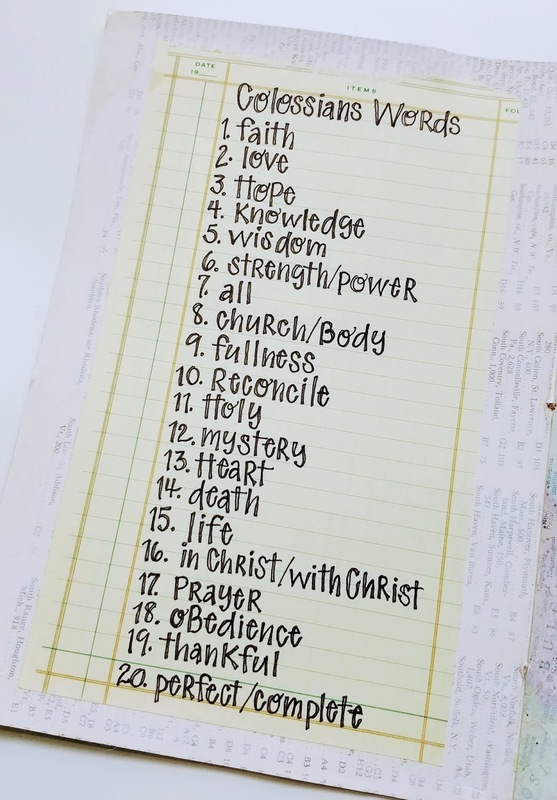 Together, over the next 20 days, we will journey through the book of Colossians by using 20 significant and key words. You are then encouraged, if you choose, to respond creatively. We used that statement for each of the persons of the Trinity. That statement is also a good place to start as we journey into the book of Colossians. You see, what comes into our minds when we think about Jesus, our view of Him and who He is, will impact every area of our lives. It is the lens by which we see faith, life, people, marriage, church, creation, and on and on. If the lens is off-kilter, then so is our perspective on everything else. We also live in a day and a culture that seeks to combine the practices of the day, the influences of the culture, and various religious views with the teachings of God's Word. We face similar struggles as the Colossian church did, with different undertones. Will we find ourselves in the pages of Colossians as we read Paul's words? Do we also need reminders of Christ's supremacy and a call to live out our identity as Christ's followers? Do we find issues of syncretism threatening churches today? Do we lose our focus in the midst of busyness and fast paced lives? Do we need a lens adjustment to re-focus on Christ alone, on Christ as Lord of our lives? Let's explore the book of Colossians together and listen for God's voice - to each of us and to the church. May Psalm 119:18 guide us as a prayer as we journey together through this book. It is also posted in the Words Facebook group. Beginning tomorrow, August 1, there will be a devotional Bible study posted here on the blog each day through August 20. Use that post and the Bible verses to inspire your creativity. You can then share your creative practice in the Words Facebook group or in the Everyday Journals Facebook group. Both groups are participating in the Colossians Words challenge. Share using #colossianswords. 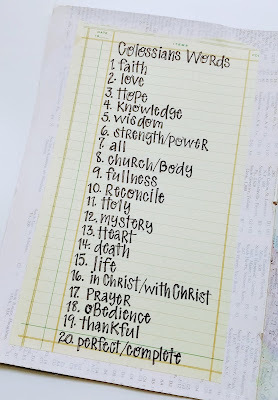 I was wondering if you would have scriptures from Colossians to connect with each word. I would like to attempt to Bible journal as we go along. Great idea Lindsey. I would like to do that too.